Blairgowrie makes a great base at any time of year from which to explore some of the best that Scotland has to offer. the town has great local shops and amenities. So stocking on holiday essentials needn't be a chore, leaving you more time to enjoy the lovely scenery and outdoors! 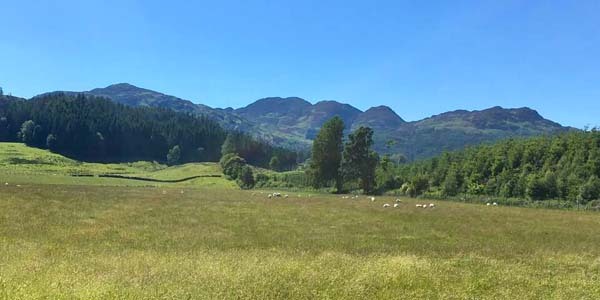 Whether you enjoy walking, cycling or driving there is something for everyone: from the network of local walks around Blairgowrie to the quiet Angus Glens or more rugged outlines of the Glenshee area, just 30 minutes by car through beautiful Scottish scenery. The unspoilt Angus coast is only 1 hour away. For those wanting to enjoy sports there are plenty of golf-courses to choose from. There is the Rosemount Course in Blairgowrie and the Glenisla and Strathmore Courses in near-by Alyth. The world-famous courses of St Andrews, Gleneagles and Carnoustie are all within a 1 hour drive. If fishing is your thing then there is trout fishing available at Brooklinn Mill, and salmon fishing can be arranged for the Ericht, Isla or Tay. This area of Scotland also boasts some very fine castles, gardens and other places to visit. Glamis Castle, with its fairy-tale turrets and built of local pink sandstone is only 20 minutes drive from Blairgowrie and is a real must for any trip to the area. The visitor centre at Stanley Mills offers an insight into a very different part of Scottish history bringing to life the jute industry which has played such a key role in the local area. And if you want to explore further afield, Blairgowrie's excellent communications and central location make it perfect base too. Edinburgh, Glasgow are 1 hour 30 minutes by either road or rail, and offer much to see and do, from Edinburgh's historic castle, to world class galleries and museums such Glasgow's Kelvingrove and the Burrell Collection.